On baking sheet, arrange potatoes in single layer; spray lightly with additional cooking spray. Sprinkle evenly with ¼ teaspoon of the garlic salt. Roast 20 to 25 minutes or until potatoes are tender and browned, turning potatoes over halfway and sprinkling with remaining garlic salt. Meanwhile, in a small bowl, mix together cream cheese, pesto and red pepper sauce, if desired. 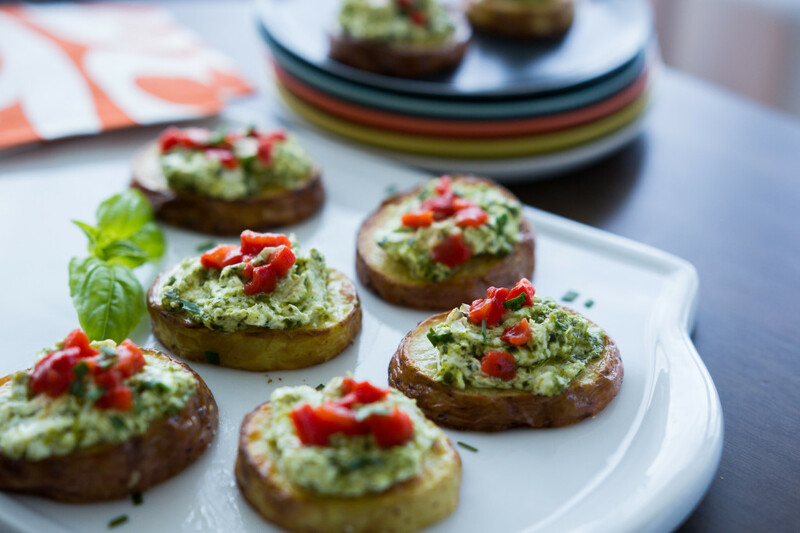 Pipe or spoon about 2 teaspoons pesto mixture onto each potato; top with red pepper. Sprinkle with chives if desired..